Markham-Stouffville Hospital (MSH) is the first community hospital to join the Kids Health Alliance (KHA), a network created by the Hospital for Sick Children, Holland Bloorview Kids Rehabilitation Hospital and the Children’s Hospital of Eastern Ontario – Ottawa Children’s Treatment Centre. Their aim is to improve the health of children and youth by adopting a coordinated, consistent, high-quality system of healthcare for families. The KHA was founded in 2017 to strengthen the paediatric health system with members who share a common goal of improving the health of children and youth in Ontario. 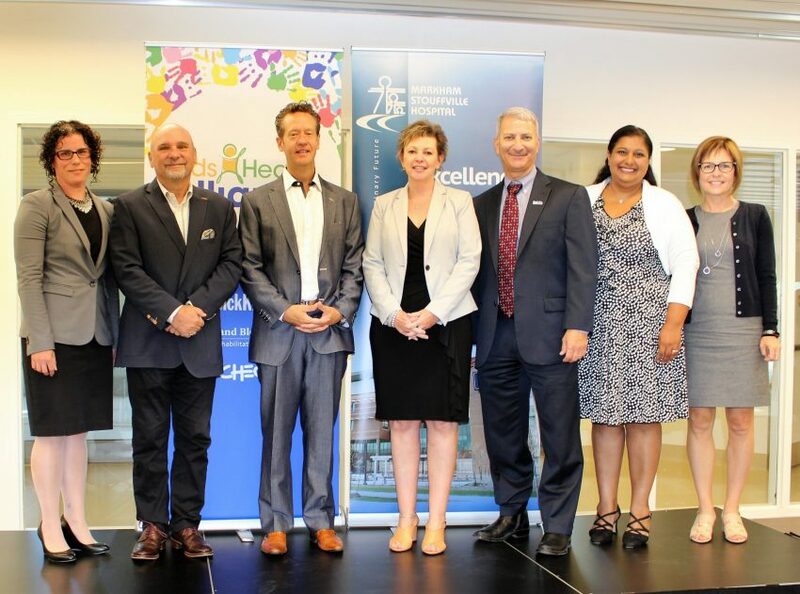 The collaboration was announced at MSH on Sept. 6. Shana Betz, the mother of one of the hospital’s young patients, came out in support of the new collaboration and the treatment her 9-year-old daughter has been receiving at MSH since she was diagnosed with diabetes at 10 months old. “As a parent of young children in Markham, I am thankful for this partnership that will bring more specialized resources close to home. It will also help if my children need to be transferred to SickKids, that the transition will be that much easier and seamless,” says Betz. Currently, in Ontario, there are six specialized children’s hospitals and 100 community and smaller hospitals with 85 per cent of visits to paediatric health-care providers for a limited injury or condition. The KHA plans to spread childcare expertise across a complex system of patient care that also includes community paediatricians, family physicians, home nursing agencies, children’s rehabilitation services, mental health providers and schools. Dr. Andrew Arcand, who heads up the Emergency Department at MSH, suggests that your local hospital should be the first point of call in most circumstances. He also points to the reality that “there are some folks in the community that might choose to go to SickKids, but with this partnership, the community can feel more comfortable when their child is sick, knowing that we have a formal affiliation with SickKids, choosing to come to their local community hospital rather than going downtown,” says Arcand. The partnership will initially focus on enhancing paediatric care in Markham Stouffville Hospital’s Emergency Department. Then through continued sharing of specialized paediatric expertise and implementation of best practices, the collaboration will extend to the enhancing care in neonatal intensive care units and paediatric inpatient units. Photo L-R: Shana Betz, Mother of MSH patient; Tom Barlow, MSH Board Chair; Dr. Andrew Arcand, MSH Chief of Emergency Medicine; Jo-anne Marr, MSH President and CEO; Mike Apkon, SickKids President and CEO; Dr. Deepa Grewal Chief of Paediatrics; and Barbara Steed, Executive Vice President, Patient Services & Chief Practice Officer.